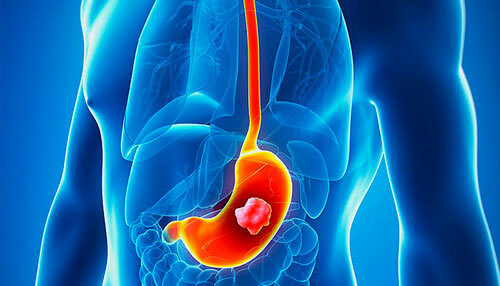 Sun Cancer Hospital is one the most trusted Gastric Stomach Cancer Hospital in Mumbai Borivali Kandivali Malad Goregaon Dahisar Jogeshwari Mira Road Bhayendar Vasai Virar Mumbai Thane Ghatkopar Mulund. Stomach cancer -- also referred to as gastric cancer -- is usually preceded by precancerous changes in the stomach lining, although these changes rarely produce symptoms. Because stomach cancer often does not cause symptoms until it is quite advanced, it is not often detected in its earliest stages. A third, newer technique to diagnose stomach cancer is called endoscopic ultrasound. Similar to gastroscopy, endoscopic ultrasound relies on a thin tube inserted into the mouth and down into the stomach. At the tip of the tube is a small ultrasound probe that bounces sound waves off the stomach walls. This test is useful for estimating how far cancer has spread into the wall of the stomach, to nearby organs, and to nearby lymph nodes -- a process called staging. The choice of treatment for stomach cancer depends on the stage of the disease -- that is, how large the tumor has grown, how deeply it has invaded the layers of the stomach, and whether it has spread to nearby organs, lymph nodes, or other parts of the body. Recent investigations suggest that a three-pronged attack on stomach cancer -- utilizing surgery to remove most of the tumor and chemotherapy and radiation therapy to control cancer spread -- may improve the survival of patients with stomach cancer. This combination approach is expected to become the standard of care for patients with this disease. total gastrectomy : removal of the entire stomach and parts of the esophagus, small intestine, and other tissue near the tumor; in this case the esophagus may be connected to the small intestine so that you can continue to eat and swallow. Chemotherapy -- treatment with cancer-killing drugs -- is another option for treating stomach cancer. It can be given to patients whose cancers have invaded the layers of the stomach wall, nearby lymph nodes, and nearby organs. Chemotherapy may be given before surgery (so-called neoadjuvant therapy) -- to shrink the tumor first -- or after surgery (adjuvant therapy), to kill any remaining cancer cells. These approaches are being evaluated in clinical trials.